I feel like I've been running a marathon, uphill. I'm slowly settling in to our new place here in North Carolina. There's been a mountain of things to get done with the transition. Moving a home, renting our house out, insurance claim, moving my business to another state, transferring medical care, car repairs, plus add a toddler to the mix and it's been quite a whirlwind. 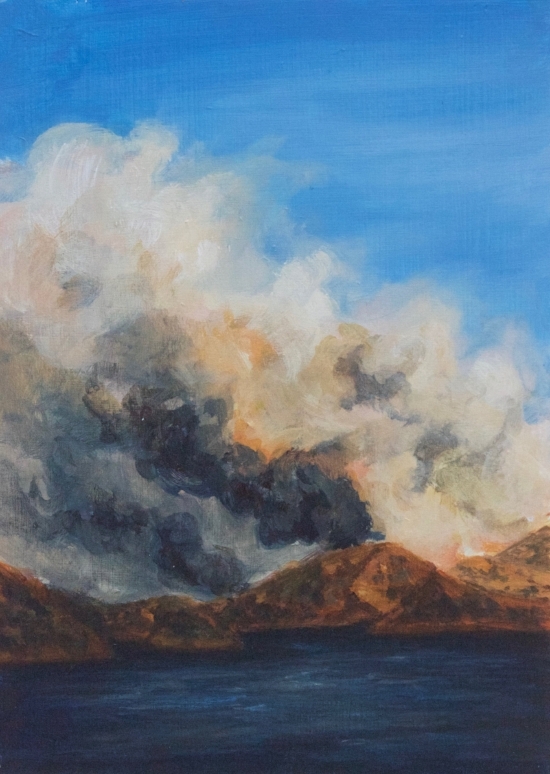 I'm almost done with everything, the only thing motivating me is that I want to get back to painting wildfires! I've got a lot of new work I completed before we left Florida that I've been wanting to share and can't wait to list it in the shop. One of the pieces--"Drought"-- was featured on PIXEL & BRACKET's Youtube channel as a time lapse. It is a short video, as I didn't record every painting session. I started this piece when I was in Utah last fall as part of my Art & Adventure trip. I was hoping to get it done in time to submit to a juried show but I just didn't have enough time. That's okay! This piece is about the drought in California and how that has increased the fire activity and intensity of wildfires in the last few years. "Drought" pays tribute to the desert nature of the west and the beauty and danger that dwells there. I wanted to portray this part of the west; the dry, brown, bleak, and wildfire ravaged vegetation. Yet finding the beauty in the landscape anyway, before, during, and after a wildfire. I find the shape of the land, and colors, humble. And the shape and colors of wildfire smoke fascinating. And through it all, I love to remember to look heavenward in our challenges, and to remember to have perspective. I believe we are eternal beings, without end, and that this life on earth is just part of our eternal journey. I believe when we have finished our time on earth, we will look down from heaven and see what a small moment our lives were in the expanses of eternity, and that through our life on earth we learned and grew in ways we couldn’t have done before. And that it was through our challenges, struggles, and tragedies that we learned faith, hope, love, forgiveness and so much more. Opposition is the story of our lives. And one I aim to portray through my wildfire paintings. We are like the earth, we experience seasons of growth, shedding, change, stillness, and liveliness. Some things seem so repetitive and cyclical, others are total disasters, suprises, or tragedies. Yet, we start over, grow, and change because we are hopeful, courageous, and strong. Thanks for checking my blog out today! Make sure to check out PIXEL & BRACKET he gives great tutorial videos! Painting A Live Wildfire--First Time! 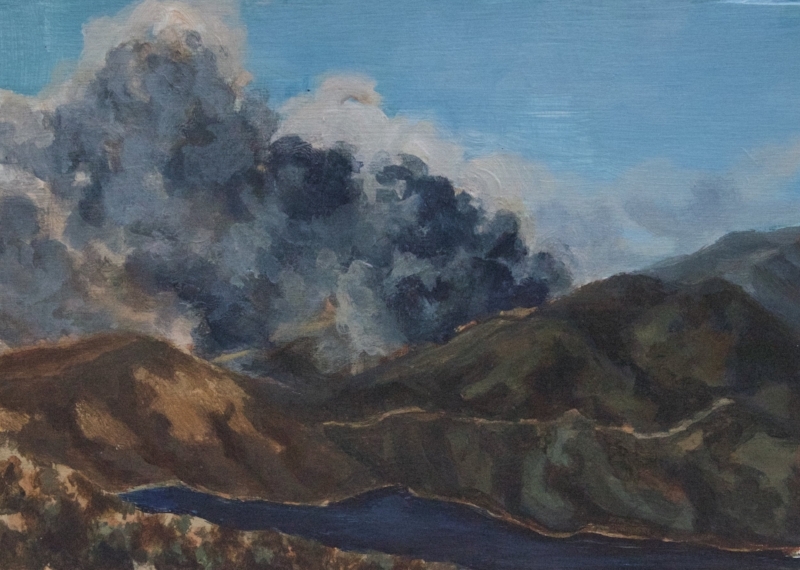 Today I am really excited to share with you the results of my first time plein air painting a wildfire! Yes, that means a real life wildfire was burning and I was outside trying to paint it. For years, I've been having dreamy visions in my head of what this would be like: Me, out in a beautiful nature setting, alone, and painting away. Haha! It was not like that. I hadn't taken into consideration many other factors, including having a baby to care for in that moment. As you may know, I'm currently on my Art and Adventure trip. And it took about one week of me being here in California before I was able to go to see my first California fire in over 10 years! I took my baby with me and my art supplies and headed out to the Pilot Fire in the San Bernardino mountains. I got there within the first 24 hours that it started and was glad I did. That's when the color and shape of the smoke cloud is usually the most dramatic. This is the finished piece after working on it at home. Then I drove down the road a little ways to a beautiful lookout point. It was a great spot to see the fire next to Silverwood lake. It was there that I tried to paint outside. Wow was that hard! The winds alone made it extremely difficult to paint, probably 20mph+ winds. And then I had a baby strapped to my back to keep him happy but more so he wouldn't get into trouble or hurt. Oh and he's 25lbs. It was a comical scene I'm sure to everyone else at the lookout point, including a news reporter. But in my head I felt like I was rocking it. I was just glad to be there to see the fire and document it myself! Ah!!! My paintings totally sucked, I only got the first layer on. Meaning I spent like 10 minutes tops on each one outside. Mostly due to the wind, but also the baby. But hey! I took them back home and finished them up. The first image is what I did at the fire and then after that is what I did at home. The pieces I did of the Pilot Fire are 5x7 inches. My in progress plein air study. I know it doesn't look like much. I needed to add a few layers to finish this one up. Oh gosh, I absolutely L-O-V-E doing this! Making these paintings out here and watching the fires. I love meeting the firemen and women. I love meeting other by-standers and striking up conversations with them. I love being able to share the other side of a wildfire's story and meaning. So many people I meet say how my work would be cool if fires weren't so destructive. But they don't really let it sink in just WHY I paint these--they are symbols of life and change! I just want to thank you for listening to me and following the journey I'm on. I feel so lucky to be out here in the west doing this trip and am so lucky to have friends, fans, and of course my spouse and entire family supporting me in this endeavor. Okay, don't want to get all teary-eyed so I'll leave it at that. THANK YOU!!!! Contact me now to purchase any of these pieces.